Never seen the movie but we saw a stage production a couple of years ago before Christmas – it was amazing! 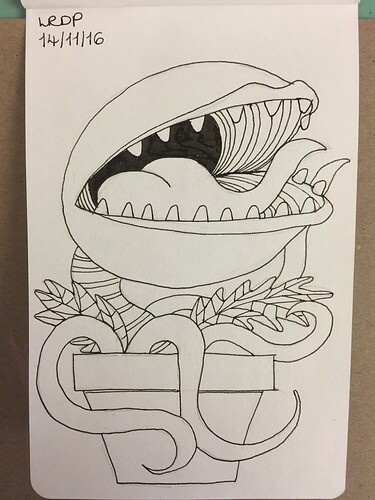 Great version of Audrey II! I would love to see it on stage! That’s a good Audrey. I bought the soundtrack album after I saw it in the 80s, so I still have all those songs in my head. We sat down with my teen to watch it three weeks ago, and he was bored half-way into it and went off to take a bath. !!! I guess it didn’t translate to 2016 as well but I still loved it. I remember liking the “Somewhere that’s green” scene and wanting all those 50s appliances and outfits LOL. I don’t know how anyone cannot be captivated by that movie. Then again, I hate ‘2001: A Space Odyssey’ even though it is considered to me one of the best movies ever made. I’m with you. I didn’t like that one, either.